Nikki Haley, the U.S. ambassador to the United Nations, said Monday that Russia is "never going to be our friend," but downplayed concerns over President Trump's meeting and press conference last week with Russian President Vladimir Putin. "We don't trust Russia. We don't trust Putin. We never will. They're never going to be our friend. That's just a fact," Haley told Christian Broadcasting Network's David Brody. [post_ads]"But what I do think is, whether it's the president sitting down with (North Korean leader) Kim, or whether the president sits down with Putin, those are things that have to happen," she added, calling Trump's summit in Finland last week a "long time coming." The president has faced a week of criticism for his performance in his meeting with Putin, where he cast doubt on the U.S. intelligence community's conclusion that Russia interfered in the 2016 election. He has since attempted to backtrack on those remarks, but muddled them with repeated claims that the meeting was unfairly covered - and that the Russian interference is a "big hoax." Trump's comments don't particularly bother Haley, she said. Instead, she's more concerned about the administration's policies toward Russia, which she said she's been pleased with. "I think what's controversial is the words that he said, but to me the actions are the only thing that matters," she said. However, she went on to praise the president's all caps tweet sent late Sunday in which he warned Iran to "never, ever threaten the United States again or you will suffer consequences the likes of which few throughout history have ever suffered before." The president's tweet appeared to be in response to remarks Iranian President Hassan Rouhani gave to a group of diplomats in which he said war with Iran "is the mother of all wars." He also seemed to leave the door open to peace talks, saying peace with Iran "is the mother of all peace." 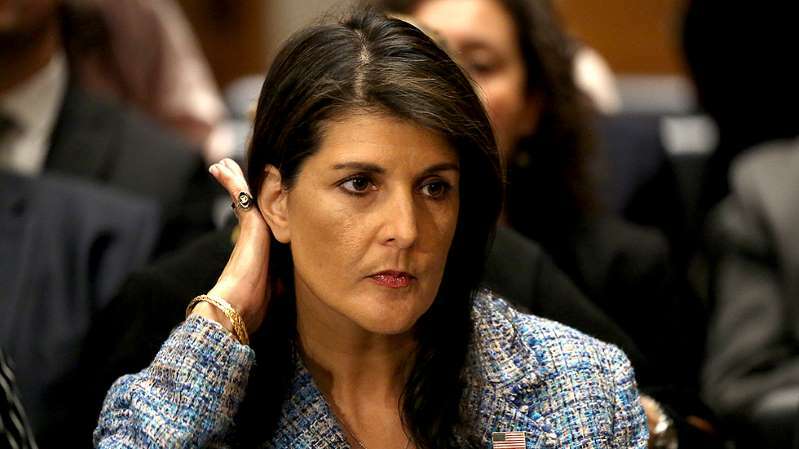 Haley said Trump's tweet was intended to send a message to Iran about the use of rhetoric to secure legitimacy in the international community. "We don't fall for that," Haley said, adding that Trump's tweet "set Iran back on its heels."